Roofers specializing in PVC Plastic Roof Installation, PVC Plastic Roof Repair, PVC Plastic Roof Roof Leaks, and all other PVC Plastic Roofing Services in CT. Call 1-888-766-3020 for a Free Quote today! 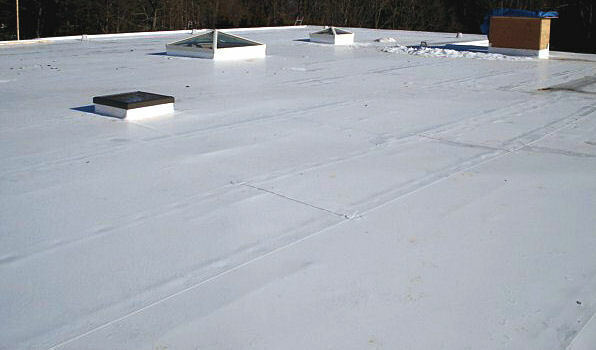 PVC (polyvinyl chloride) Plastic Roofing is one of many roofing systems that New Roof Connecticut’s commercial roof contractors service throughout Connecticut. 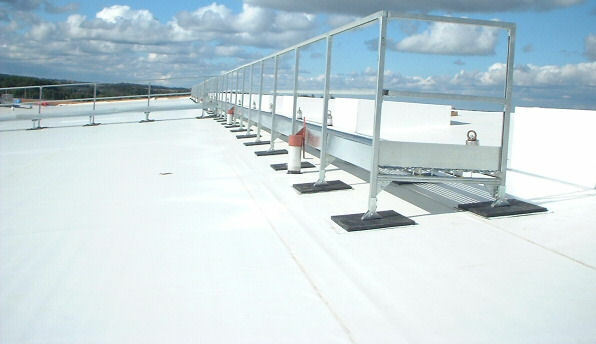 If you have a commercial building in Connecticut with PVC Plastic Roofing that requires repair or you're looking for a new roof installation with PVC Plastic Roofing then contact New Roof Connecticut at 1-888-766-3020 or request a Free PVC Plastic Roofing Quote. Our commercial roofing contractors have years of experience working throughout Fairfield, Hartford, Middlesex, New Haven, New London, Tolland, Windham and Litchfield County with flat roofs of all types on all building types. Other types of flat roofing systems that our professional roof contractors service and install are: EPDM Thermoset Membrane, Modified Bitumen Membrane, Asphalt Built-Up Roof (BUR), TPO Thermoplastic Membrane, and CSPE (Hypalon) Thermoset Membrane. The PVC Plastic Roofing system is made by a process of heat welding seam technology that allows a single layer of PVC (polyvinyl chloride) plastic to cover an entire roof surface without any seams or joints. This makes PVC roofing very flexible and versatile to use for any shape surface. PVC roofing material is waterproof, dirt resistant, and has excellent durability and high resistance to punctures and impact. PVC roofing is a fire safe and energy efficient material. Installation is quick and simple and it can also reflect nearly 90% of the heat of the sun, thus lowering energy costs significantly. PVC roofing also has good tolerance for thermal movement because of its flexibility, and is extremely tough against contamination and rooftop soiling therefore being very low maintenance. PVC Roofing offers good long-term performance for a low slope roof and is aesthetically appealing, and suitable for both old and new structures. For more information request a Free PVC Plastic Roofing Quote or call 1-888-766-3020. PVC is a single-ply flat roofing system and we can help you whether you need PVC roof maintenance, new PVC roof construction, PVC re-roofing, PVC roof repairs, waterproofing, or preventative maintenance. Learn more about any of our Connecticut roof construction services: new roof construction, roof repairs, re-roofing, roof renovation, retrofitting, remodeling, preventative maintenance, roof leak repair, waterproofing, flat roofing, metal roofing, tin roofing, metal roofing, copper roofing, asphalt roofing, roof flat, rubber roofing, flat roofing repair, EPDM roofing, PVC roofing, Thermoset Membrane roofing, Thermoplastic Membrane roofing, Modified Bitumen Membrane roofing, commercial roofing repairs, roofing shingle, roof truss, roof insulation, roof cladding, and timber cladding. New Roof Connecticut has the solution to all your roofing needs so request a Free Commercial Roofing Quote today or call 1-888-766-3020. If you are looking for a reputable roofing contractor in Hartford, Fairfield, Windham, Litchfield, New London, Middlesex, Tolland, or New Haven County then you've come to the right place. New Roof Connecticut is a professional roofing company servicing all industries and markets including commercial, residential, industrial, institutional, healthcare, government, and educational. Call 1-888-766-3020 today to get started with your roof construction project with New Roof Connecticut or request a Free Commercial Roof Quote. Our skilled roofing contractors are Licensed and Insured and have years of commercial roof construction experience working with all major roofing manufacturers like Carlisle SynTec, CertainTeed, GAF-Elk, Tamko, Firestone, IKO, Owens Corning, Johns Manville, Sika Sarnafil, Fabral, Soprema, Malarkey, Pabco, Decra, Polyglass, Met-Tile, Monier Lifetile, EcoStar, Tremco, Durolast, Classic Metal Roofing, and more. We provide Emergency Roofing Services and our roof specialists can help with planning and budgeting your roof construction projects. New Roof Connecticut is your trusted source for professional quality commercial roofing services from new roof construction to re-roofing, roof maintenance, and roof repair. Request a Free Commercial Roofing Quote or call 1-888-766-3020 today! © 2010 New Roof Contractors. All rights reserved.